To add a word, a topic, a question, a headline or whatever you want to search with Google, you have it, no matter where you are, just highlight, copy and then in the click.to menu select “Google”. The text can come from a PDF document, from an e-mail, from a website, from your address book, or from a file name. 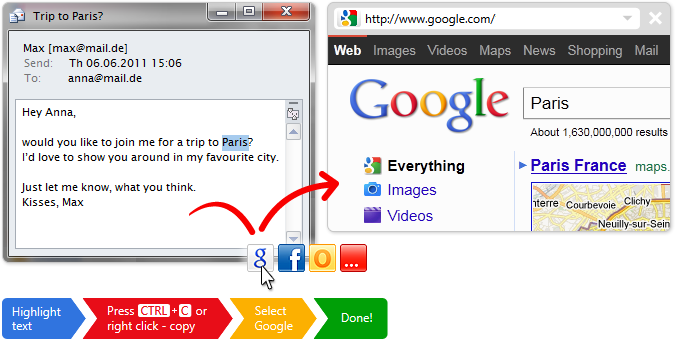 With click.to, Google can be reached from anywhere on the desktop – even without a previously copied word on the clipboard. Just enable “Quick Access” in the click.to options menu and view the click.to satellites by moving the mouse cursor to the top of the screen. Select Google and enter your question: click.to automatically opens your Internet browser,goes to Google and enters your search results immediately! 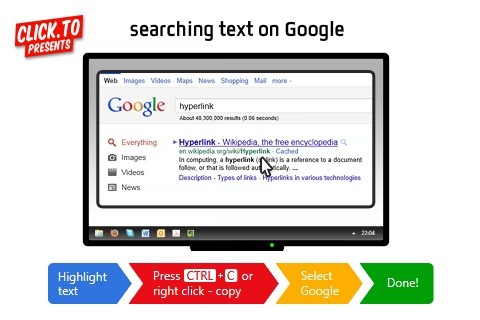 With click.to you can easily google any text on your screen – always with just one click.